There’s no need to remind anyone of the headlines in the news regarding disasters. In the U.S., alone, there has been one disaster after another. The past few years has seen an increase of both natural and man-made disasters and these catastrophic events can sometimes put a small business on its back with no sign of someone turning it over. When disaster strikes the small business has to be prepared for the event and how to maintain one’s cool as well as recover. Thanks to advances in various technologies we can see some disasters on the horizon and prepare for them. Even for the unforeseen disasters, a small business can recover if they use such technologies responsibly. Social media is one tool of immeasurable value and it’s wise to make sure one knows how to use it. The primary thing is to know how to operate the various social media venues for your marketing. You want to use it for preventative and remedial actions. You don’t want to get caught on the bad end of a disaster. You will lose too much ground to your customers and competitors. If your goods and services are in need and you’re capable of providing them but no one knows what’s going on with your company, they’ll look elsewhere and the next thing you know you’ll be staring at a blank parking lot where customers used to park. The old saying that an ounce of prevention is worth a pound of cure, fits in perfectly here. You have to understand that your online customers live in various parts of the world. Some live in areas where the biggest danger is an occasional thunderstorm. Others live in areas that are prone to earthquakes or tornadoes and as we’ve seen of late, hurricanes. You need to be prepared to accommodate your online and brick and mortar customers and the preventative measures means keeping your website up to date and easy to use. You may have goods and services that people in a disaster need desperately. Often disaster stricken areas may lose electrical power or other valuable resources. Luckily, mobile and WiFi have allowed for people to communicate during and after such disasters. As a matter of fact, that’s why the internet itself was invented. To provide communication and accessible information databases in case of war or natural disaster. So far it’s showing that it works. 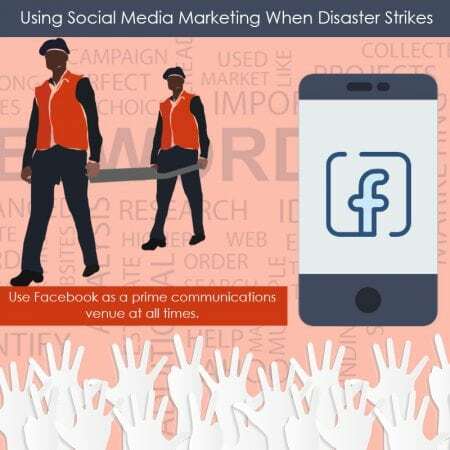 Even though you can communicate during a disaster via mobile, if your website isn’t mobile friendly and your website doesn’t have the information the distressed surfer needs, then you’re in major trouble. Not only will you lose sales, but you’ll lose an opportunity for promotion like no other. People remember who was there when they were in dire need. Not only do they remember but they laud such people and businesses and authorities that were there when people needed someone most. If your services aren’t accessible during a crisis you’ll have lost out on present and future business. Your social media marketing has to be spot-on. Make sure you do have a disaster contingency at hand. You might even extend communications to all your clientele on what to do if an emergency occurs. Use Facebook as a prime communications venue at all times. Even offer assistance along with other businesses online and in your area to work as a team to help out. For example, if you have a friend’s business in an area hit by disaster and they can’t help their local customers, be ready to do something they can’t provide for them like shipping or contacting people. This will lead to major marketing bonuses that can last a lifetime. Accommodating your customers is your lifeline in business. Even when you or your customers are at wit’s end due to a crisis, you have to understand that as a business owner you need to stay cool and provide the kind of communication and service that stabilizes and boosts your marketing endeavors. Using social media, especially mobile social media is not only wise but imperative. So that’s it. It’s better to be able to handle a crisis situation with your business and customers no matter what happens. Companies like Local SEO Tampa are specialists who will always be on the ball. Let them get you started in the right direction and if disaster strikes, you’ll be at the ready.